Demand Generation has been transformed by a plethora of social engagement channels making driving pipeline easier as well as more complicated. This webinar discusses how to define a demand generation strategy that consistently produces qualified leads. Instead of experimenting to see ‘what works’, focus on discovering and aligning to what target buyers do, look for, and respond to in their buyers journey. The findings from a recent study on of how Fortune 100 CIOs and VPs evaluate and buy emerging technology are shared. You’ll learn how to convert this knowledge into demand generation programs that consistently deliver high quality leads; at a lower price. 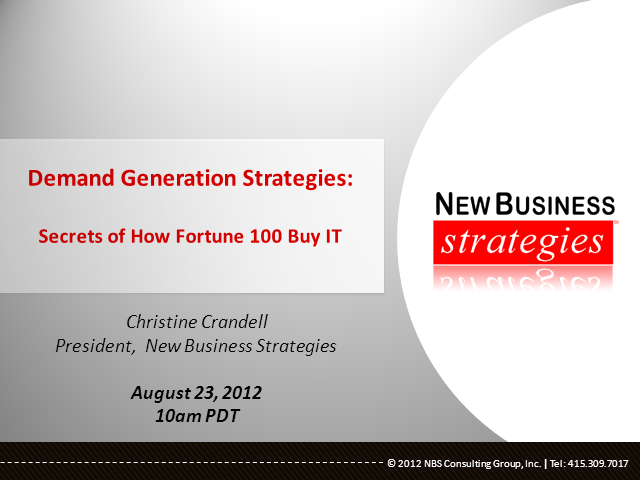 If you’re selling technology products, this is a ‘must attend’ webinar. Christine is the President of New Business Strategies where she has advised over 100 companies including Good Technology, McKesson, and Oracle on how to dramatically improve revenue performance. She is also a frequent writer and blogger for Forbes.